Venice Palms is a charming neighborhood on the north flank of East Venice Avenue only about a quarter mile west of the roundabout on Jacaranda Boulevard. 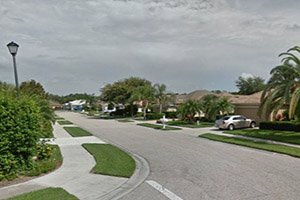 The location of this community makes living in it also convenient to Interstate 75, which is only about a mile north of the homes for sale in Venice Palms. 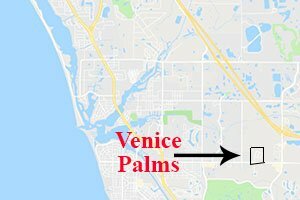 Venice Palms spreads on a parcel of about 72 acres platted for 174 single family home sites. The master strokes of the developer of this community, Venice Gateway Properties Ltd., immediately manifest in its entrance. Here, palm trees and lush greeneries provide an elegant touch to the landscaping and set the neighborhood’s quiet and serene character. Developed from 1998 to 2005, Venice Palms’ acreage came out as a nature lovers’ oasis. Its northern perimeter provides an extensive paved pathway along lush trees on the banks of small waterway and past a lake where nesting birds visit frequently. The community was developed in two phases, and the orientation of its internal streets allow maximum convenience to the residents. Its main street Venice Palms Boulevard is laid out in a figure of “P” with Coco Palm Drive bisecting the figure’s loop. Side street Date Palm Way connects to it on the east, while King Palm Court and Canary Island Street link to Venice Palms Boulevard from the west. Notably, the homes for sale in Venice Palms are outside of a flood zone and are not covered by any CDD. Smaller but equally stylish neighborhoods flank Venice Palms, providing some easy benchmarks for market comparables in its immediate neighborhood. Wedged adjacent southeast of this community is the infill residential development of Enclaves of Venice North, while Valencia Lakes is on Venice Palms’ western edge. Like most of its neighbors, Venice Palms is a pet-friendly community. All of the residences are of concrete block stucco construction with either asphalt shingle or tile roofs. Well-maintained community pathways and landscaping enhance the curb appeal of Venice Palms homes for sale. Venice Palms is a relatively active marketplace for buyers and sellers, with ownership of some 30 residences changing hands between 2017 and 2018. These deals involved properties priced from the upper $200s up to the $400s. The floor areas of these homes measure between 1,750 and 2,450 square feet designed with two up to four bedrooms. The top picks amongst these are those residences built onwards from the year 2000 designed with two bedrooms and two baths within a floor area approaching 1,800 square feet. Typically priced in the low $300s, such market offerings could be sold within a few weeks of their listing on the MLS of Sarasota homes for sale. Venice Palms’ proximity to providers of all conceivable wants and needs of quality living helps these quick sales. The community, for instance, is walking distance to Jacaranda Commons where there is a CVS Pharmacy and a Publix. 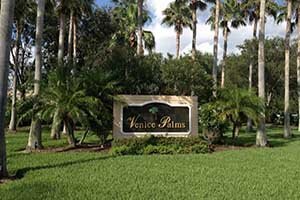 A number of golf and country clubs, such as Capri Isles and Pelican Pointe, further enriches the lifestyle choices for Venice Palms’ residents. A short trip west of just three and half miles opens even more life and leisure activities on Venice Island where a downtown itinerary can easily shift to the nearby parks and Gulf Coast beaches. Below are the current real estate listings available in Venice Palms. Listing courtesy of: SARASOTA REALTY ASSOC., INC.